Do you ever dream of going on vacation to a faraway place where beauty is everywhere? I do, and when I think of natural beauty I often envision the French countryside, particularly Provence, with its blue skies, bright sunshine and endless fields of lavender. 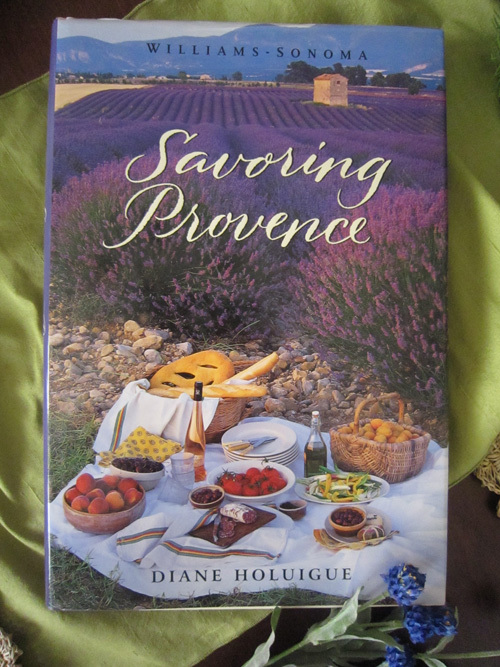 This lovely region in the south of France filled with sunflowers and saffron yellows fascinates me and this tablescape recreates that ambiance. The colors of the area are conveyed in the bright blues, greens and yellows which were combined with many different textures. The centerpiece was created using a rustic pitcher embossed with leaf patterns and filled with silk wildflowers. 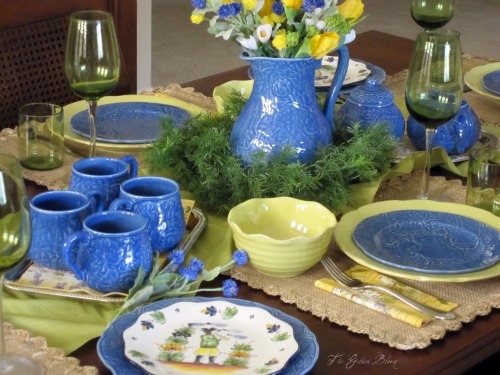 Chartreuse dinnerware was mixed with decorative blue embossed dishes and highlighted with painted salad plates that resemble the famous Breton Quimper pottery. 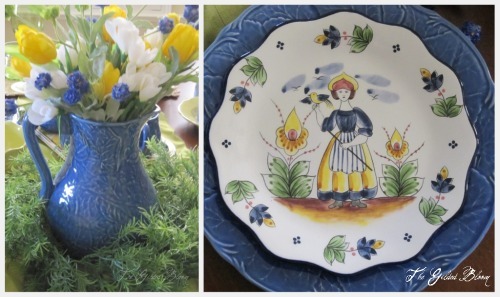 The golden yellow napkins depict a village scene amid lavender sprigs and olive trees and the salad bowls with wavy edges look like handmade dishes. Green water goblets and wine glasses emphasize the chartreuse table runner and greenery encircling the centerpiece. Thank you for your kind comment and for the invitation! I'm so glad you like the color scheme. Thanks for commenting and for the visit!